With the launch of the GeForce GTX 295 last week, Nvidia has started to roll out its 55nm GT200b GPUs onto the market. Today the company is rolling another new graphics card – the GeForce GTX 285 – but unlike the GTX 295, the 285 utilizes just a single GT200b GPU. We spent some time going over the minor changes made in the GT200b during our GeForce GTX 295 review, so we will not spend a lot of time going over them again here. The best way to think of GT200b though is that it's just GT200 on a finer manufacturing process with a few small enhancements. The GeForce GTX 285 is coming to market to replace the GTX 280 which has been Nvidia's flagship product since last June. Like the GeForce GTX 280, the GTX 285 features a full 240 stream processors arranged into ten stream processing clusters, 80 texture units (eight per cluster) and 32 ROPs backing out onto a 512-bit memory interface. What Nvidia has done is increase the clock speeds across the board. 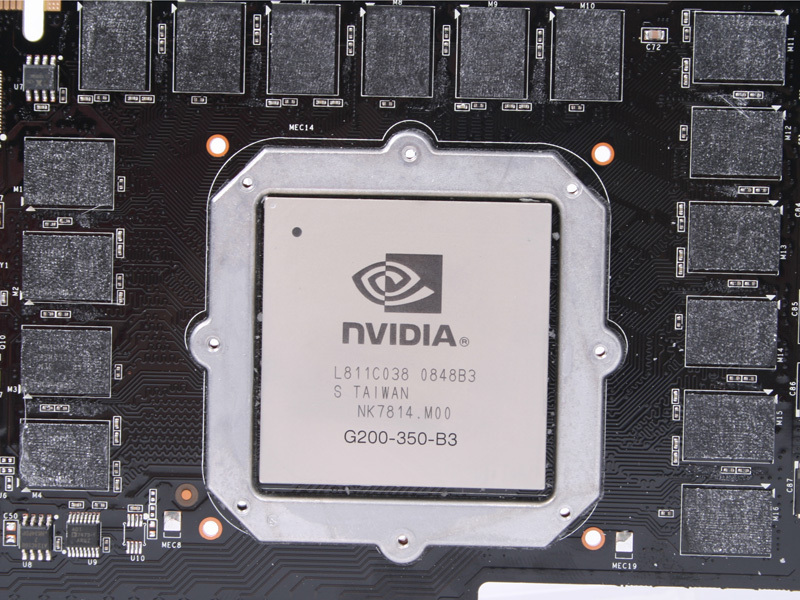 The core clock, at which the setup, texture units and ROPs are clocked at, is set to 648MHz, while the stream processor and memory clocks are 1,476MHz and 2,484MHz respectively. This results in some pretty impressive single GPU theoretical throughputs – there's 51.8 GigaTexels per second of texture throughput and 159.0 GB/sec of memory bandwidth available. 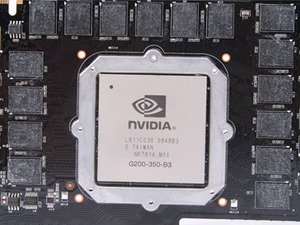 It also takes the maximum theoretical compute throughput to just over 1.06 teraFLOPS as well, making this the first Nvidia desktop GPU to break through the teraFLOPS barrier. 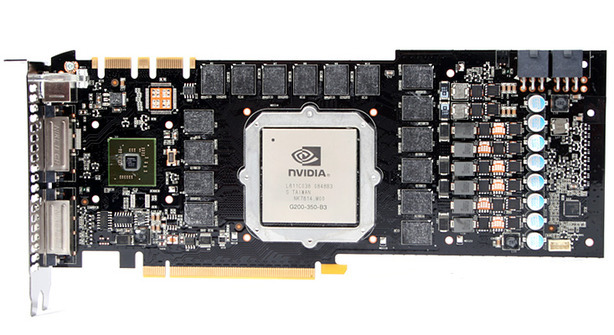 However, rather than just stick with the existing design and just replace the GPU, Nvidia has done some work on the PCB to optimise it in a number of ways. The first of these optimisations is to move all of the 16 memory chips onto the top side of the PCB, meaning that they're now all actively cooled by the heatsink that also cools the GPU core – this should help with overclocking and it's also why Nvidia has managed to hit such a high GDDR3 memory clock speed for its reference frequencies. Like the original GT200 chip, the display processing is still handled by the NVIO2 chip and has support for dual dual-link DVI ports (with HDCP) and an HDTV out connector. In addition, it includes support for 10-bit-per-colour outputs, but there's no direct support for DisplayPort – partners will have to add in their own DisplayPort controller chip should they wish to adopt the new display interface technology. 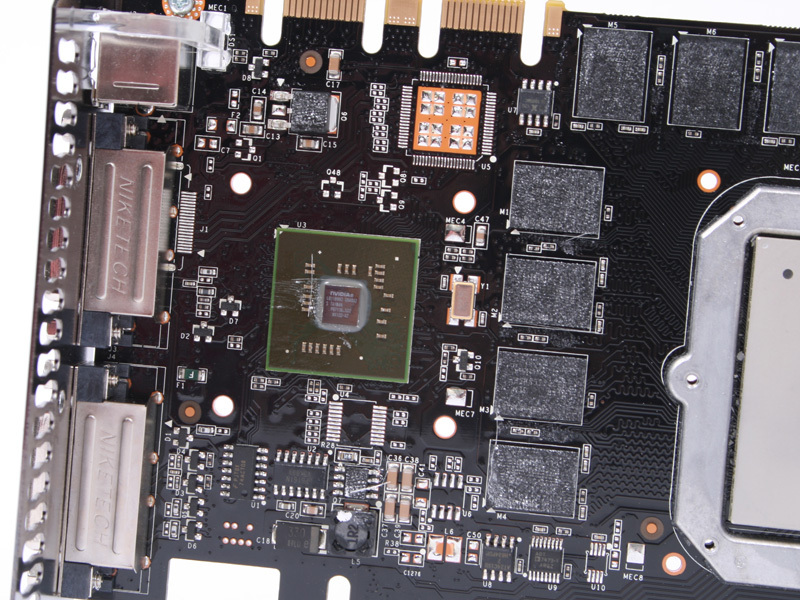 Another area where Nvidia has made some fairly significant changes is to the power layout on the board. 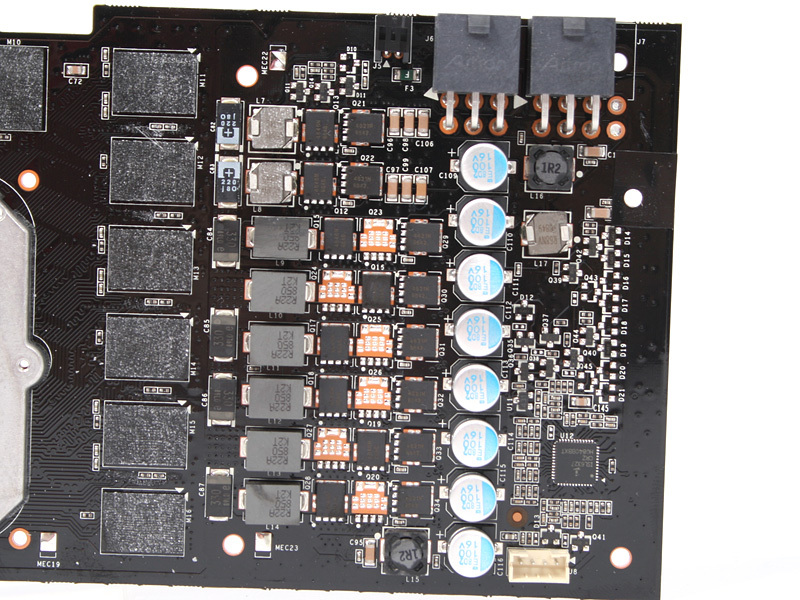 A number of our sources have confirmed that there were some problems with the GTX 280's original PWM circuitry layout and that was what prompted Nvidia to redesign the board. The issues cropped up with a large proportion of power supply designs and caused resonation that was conducted back up to the power supply, causing it to whistle in certain load scenarios. The new design features a six phase PWM design for the GPU and a further two phases for the GDDR3 memory – these allow the GPU to switch between its various operating modes while maintaining good power efficiency. What's more, the 55nm die shrink also means lower power consumption – Nvidia has lowered the maximum quoted board power from 236W to 183W and this means the board no longer requires both six and eight-pin PCI-Express power connectors. 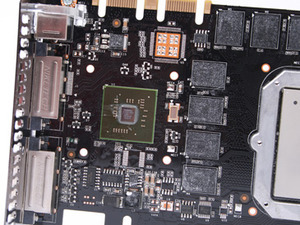 Instead, the GeForce GTX 285 features just a pair of six-pin connectors and both need to be connected for the card to function. 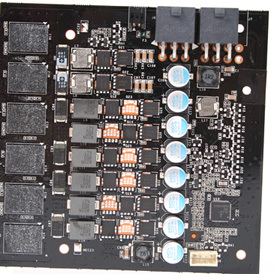 Unfortunately though, we experienced some whistling on the three samples we have in house that are all based on the new Nvidia reference PCB design so it doesn't look like the problem has been removed completely. However, it could be that the issue is limited to our samples or to the small number of power supplies we've tested the card with so far – we'll be conducting further investigations with a number of sources who we've been working with on the aforementioned GeForce GTX 280 issues that we still haven't got to the bottom of. Nvidia has thus far denied that there is an issue, saying that it has not been able to replicate the problems we've encountered – the company has said it is working to try and replicate our test system and power supplies but we haven't heard any progress on getting to the bottom of the problem yet. Should the two issues (GTX 280 and 285) be related though, the whistling may not be limited to just a couple of power supply units that we happen to have struck it luck with – the 280 whistling has been replicated across a large number of different power supplies so far in the testing that has been completed behind closed doors in conjunction with the graphics card maker.